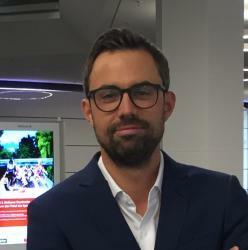 David Gruenmayer, Full-Time MBA Class of 2016, working as a Sales Director at the Investment Fund Company DekaBank, located in Frankfurt. Massive. It does not matter if you take the subway, the car, the bus, a taxi or a bike – from wherever you enter the new campus – you find yourself in front of a massive building. The first impression creates the picture of a huge sand stone rock – a canyon. The second enables the view on details like the five towers representing the five different continents of our planet. From the size of the building you realize that the Frankfurt School developed massively and still follows the often announced statement “size matters”. Impressive. Despite the fact that the old campus had everything you need to graduate – the new one makes it even more attractive. The modern architecture of the campus and all the sustainable mini concepts inside it – give you the impression of progress on all levels. If you enter the spacious doors and take a quick look into the building – it feels as if you are entering a mall. And – who does not like to shop for wisdom in a cozy mall? The Scandinavian concept of the campus enables different levels to encounter people. You easily meet one of your colleagues on the ground floor in the cafeteria, the restaurant or between the giant pillows in the relaxing zone as well as on every floor’s open tables, think tanks or meeting rooms. It seems as if no student is in a hustle to catch a place in order to learn, talk or relax in the learning lounge. This is one of the great improvements in comparison to the old campus – from my personal perspective. Comfortable. One of our professors always said: “Wisdom” has always been there, only the way of accessing it has “changed”. What could be a better expression for the comfortableness of the new campus? Comfortable seats in the Harvard lecture rooms, comfortable seats and tables at the library, seating pillows and light concepts make it even more comfortable to access the wisdom from the professors, doctors, online sources or books. The new campus gives you the feeling that the perfect learning infrastructure is a combination of comfort and home-being under the ceiling of transformable functional space. If you are interested in an MBA and in the Frankfurt School campus you should definitely visit one of the monthly MBA Information Evenings (campus tour included). As a former full-time MBA student – I can’t wait to return for the next guest lectures, social events or reunions of the future. 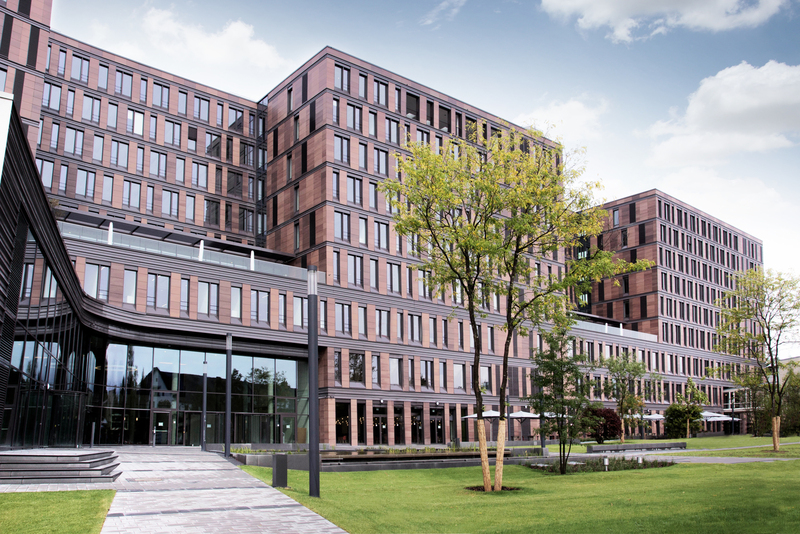 The new campus conveys the impression of a perfect condition to access the wisdom accessible at Frankfurt School.